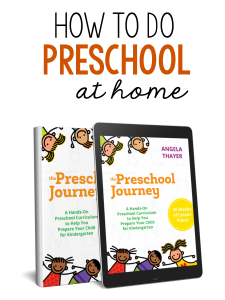 Today I’m honored to be part of a group of bloggers which has teamed up to illustrate key concepts within the book Ready for Kindergarten!, by Deborah Stewart of Teach Preschool . 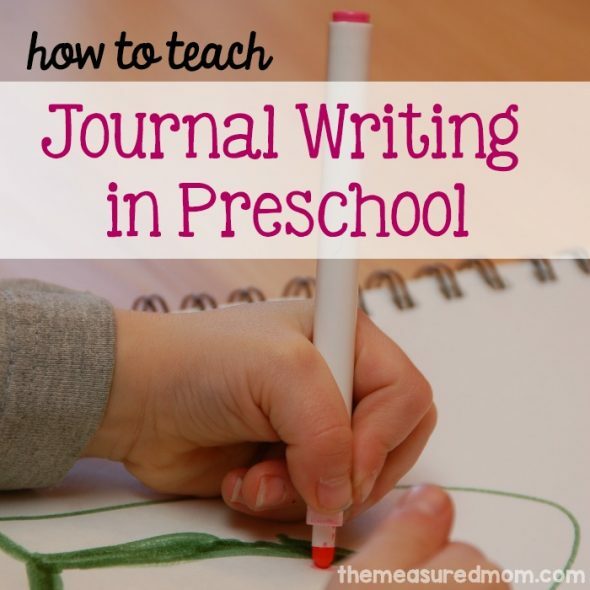 I’m going to share how to teach journal writing in preschool. I have four children of my own. Two of them, my Three and my Five, are preschool boys who love to write! No, they’re not writing stories, poems, or reports. What they’re doing is communicating on paper – each at his own developmental level. In the tips below I’ll share how I’ve helped foster a love of writing in our home. Choose unlined paper. 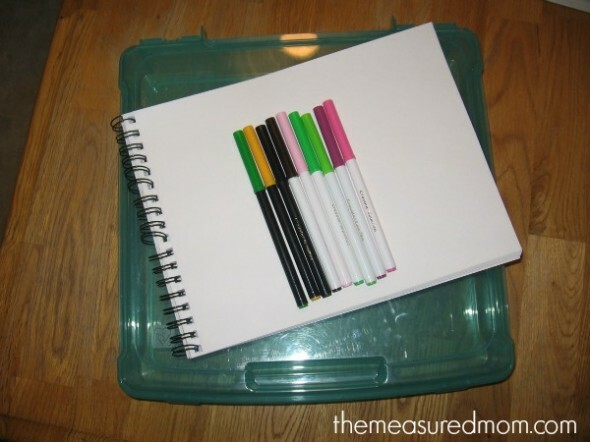 If you don’t want to purchase a sketch pad, you can staple together a stack of plain typing paper and put a sheet of colorful construction paper on the front and back. Stay away from pencils for now. Young writers will appreciate the color that markers and crayons bring to their writing. Pencil erasers are distracting, and colored pencils can be frustrating for children without a very strong grasp. Note: a reader has had great success with these first colored pencils from Crayola. I’ve never tried them, but they look great! 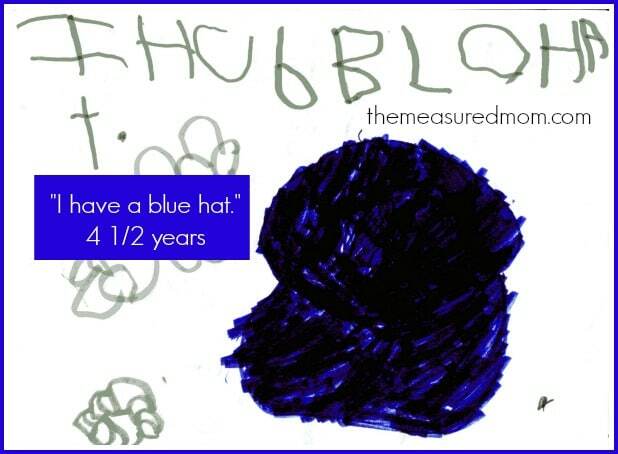 While lots of materials are fun, don’t overwhelm your preschooler. Consider offering stamps, stickers, post-it notes, and other writing tools one at a time. 2. Keep in mind your overall goals. We want to foster an early love of writing. You can get there by keeping the pressure off. Writing time should be relaxed and fun! We want children to learn that they communicate through their writing. 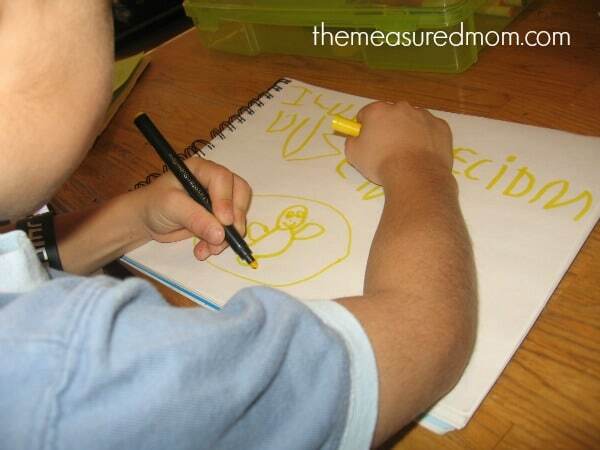 If your child draws or scribbles, ask what the writing says. This may be hard for him at first. Model it: draw something yourself, and then tell your child just what you want it to say. Keep giving him the opportunity to tell you his story. Some teachers and parents like to write what the child says alongside the writing. This way your little writer can see how his words look in print. We want children to have the confidence that they can write! Get there not by focusing on what your child can’t do, but by building on what he does do. 3. Understand the early stages of writing. Children begin scribbling as toddlers. 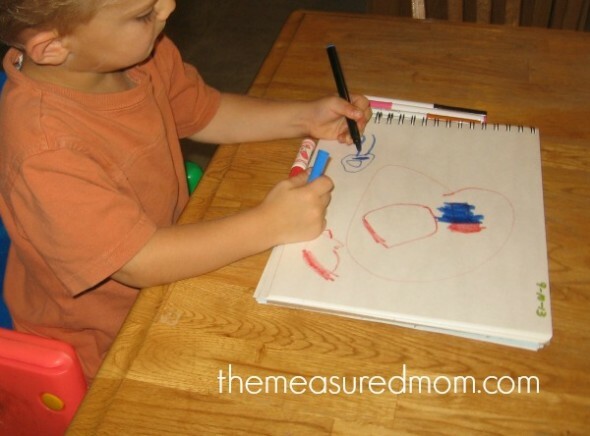 Most three-year-olds learn to draw basic shapes and pictures. Eventually, children will attempt to write scribbles that represent real writing. 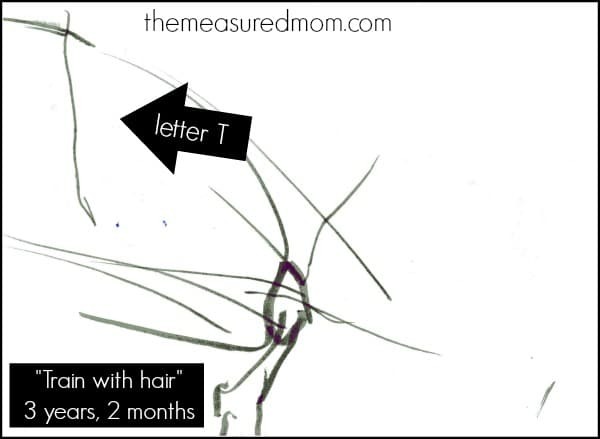 You will start to see letter-like forms within the scribbles. 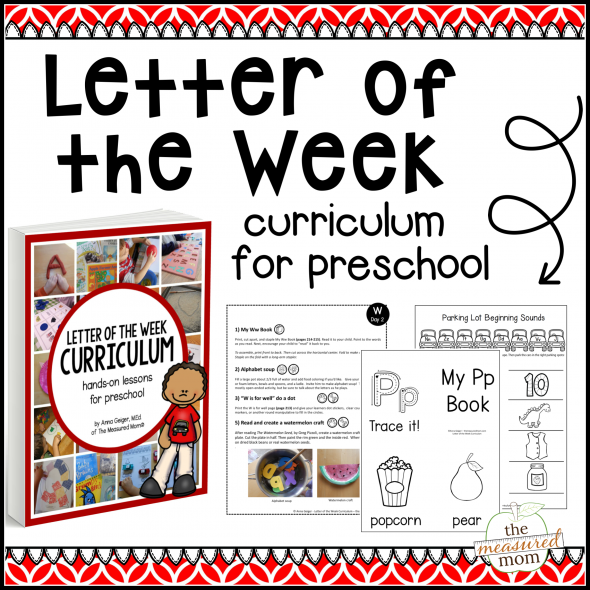 Around age three or four, many children learn to write the alphabet correctly. 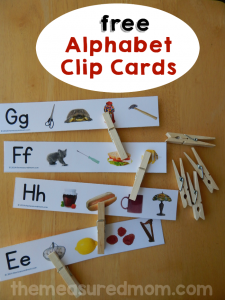 Some preschoolers will be able to attempt spellings of real words. 4. Establish a simple writing routine that works for your family. Aim for at least once a week, with a goal of three or more writing sessions. The more we read to our kids, the more they’ll love it. The same goes for writing! Keep your materials accessible. We keep our writing boxes in a nook by the kitchen table. When it’s time to write, we pull out the boxes and get to work. Expect a brief writing session. Don’t be surprised if early writing times are just ten minutes. As children grow in their writing ability and attention spans, it could last 20-30 minutes – or even longer. 5. Keep writing time structured, but open-ended. Start with conversation and modeling. Talk about your your week. What fun things could you write about? Write in your own notebook first. Model what your child can do. For example, if your child is drawing and can write a few letters, draw a picture of something you’ve done and label it with a single letter. If your preschooler is more advanced, model writing a simple sentence. Give your child a chance to write – with a few parameters. We don’t have many rules for writing time, but one I stick to is that we keep our writing to a single page. This encourages my boys to think before they commit to their story. It also limits waste and encourages them to expand their writing and picture to take up a large space. Occasionally my Three will do just a few scribbles and ask to write another story on a separate page – sometimes I let him. Whatever your child is doing – whether that’s scribbling, drawing, or forming letters and words, call it writing! If your child is just drawing, ask him to write some words. See what he does — is he attempting to make letters? 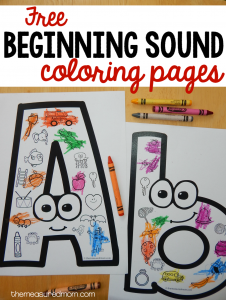 If your child is learning the letter sounds, help him figure out the first letter of what he’s drawing and form that letter alongside it. If your preschooler is learning to sound out basic words, help him streeeetch the sounds in a word and write it next to the picture. If he’s ready, assist your preschooler in writing a complete sentence. Show interest, ask questions, and celebrate any small successes! Did your child draw something you can recognize – scribble from left-to-right, write a letter to stand for a picture, or attempt to spell a new word? Call attention to it! Celebrate! I hope this post will be valuable to you as you study chapter 14: Ready to Write. Are you looking for more posts that illustrate the chapters in this book? Check out this link. 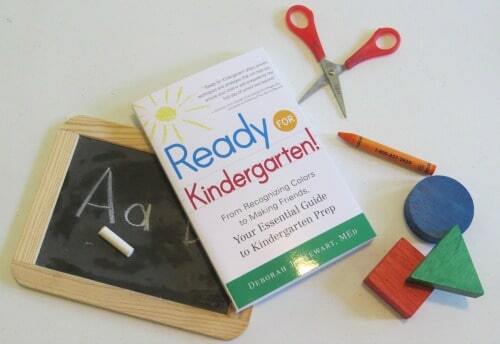 And consider visiting Amazon to order your own copy of Ready for Kindergarten! I totally needed this encouragement. I don’t spend any time writing with my 4 year old, yet I expect him to be able to write in Kindergarten. We just started PreK and even though I was a K teacher for many years I still flounder when it comes to teaching my own kids. He is getting more interested in coloring, drawing and scribbling. I just need to have a focused time to do this with him that is enjoyable and non-threatening. Thanks for the tips! Thanks for commenting, Shonda! Like you, I struggled with getting starting with this even thought I taught for many years too. I am still working at getting into a regular writing routine with my preschool boys – my goal is 3 times per week. You’re right that when it’s focused, enjoyable, and non-threatening, you can’t go wrong! I’ve found that when I leave composition books out in the different learning centers in my pre-k class that the children write more willingly than when I have scheduled writing time. I have done the same exact thing. 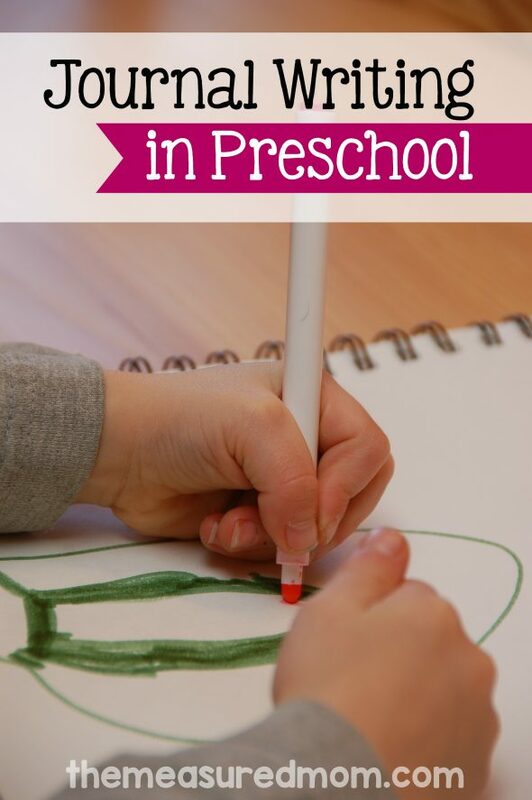 I’m the beginning, I was so nervous about leaving markers at the different centers (home preschool – “In my home” lol) and knowing that markets are so much easier for them at first. It took a couple of days (many many reminders) of how we only write on paper in our centers. I then started off in one center for a couple days then slowly added additional centers each day. Now, we have clip boards, paper and MARKERS in every center. It’s a beautiful thing watching all (ages 2-4) the kids write all day long. Hi Anna, These journal samples look so familiar! I love these sweet pictures and writing! 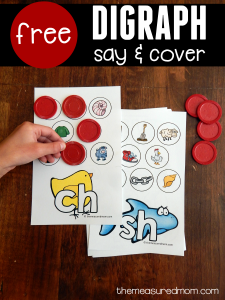 Wanted you to know I left a link to your blog at The Pioneer Women encouraging people to use your free printable readers for beginning readers. Thank you so much for linking to my blog, Jeannine!! Thanks for commenting, Bonnie! It’s true that when we make writing time a routine, preschoolers can learn to love it. That’s great that your students get a lot of opportunities for writing! My preschooler is just getting into letters (finally!). She wants to learn to write her name so she can get a library card. I never thought about having a regular time set aside just for writing. There are so many great ideas in here. Thanks for sharing! You’re very welcome, Emma! Thanks so much for stopping by! Thank you so much for the big help. My 6 year, is still having difficulty in writing. Please suggest. I also teach preschool. 31/2 to 4 year olds. We do a portfolio for each child — usually a folder or binder where I keep some of their work all year to show progress. I save assessments I’ve done with them, photographs, and recordings of funny things they say besides journal stories w/pics and dictated stories. They love telling stories and illustrating them! The children in my class have always enjoyed pencils also (and pens actually! ), so I encourage their use in writing as well. Sometimes the erasers can be distracting, but not too bad usually. Hi Sarah! That’s great that your kids do well with pencils. One reason I don’t have my five year old use them is because he gets focused on having everything perfect – so he erases if he makes the slightest mistake and doesn’t get much written. Obviously that’s not the case with every child though, and I’m glad your class uses all sorts of writing tools! Yes, I’ve had children who are perfectionists before! I feel so bad for them that they think things have to be perfect so young…but usually the extreme perfectionists I’ve seen can get just as frustrated using markers. I’ve seen kids tear up a paper, cry, etc. =/ Another teacher that kind of trained me taught me to purposely make my own mistakes right in front of children who need things perfect. I might “color out of lines” – though we rarely use color pages – and say, “oops, I made a mistake. That’s okay! I can try again later!” That lesson always stuck with me. What a great tip, Sarah! Thankfully my kids aren’t as perfectionist as some of those yo’ve worked with. I do love the idea of modeling making my own mistakes. I will definitely use that. Ha! Like spelling yo’ve wrong. Mine love to draw things they see on walks. Never thought about it — but they are doing journalling! That’s wonderful! I can see this being something that my three year old will enjoy in the next year or so. My five year old is too busy tearing around his big wheel! This post is amazing. I totally wish I had started journal writing with my son earlier. It would have been such a wonderful way to record his thoughts and insights. We should have started this a while ago! I guess it’s never too late to start. No, definitely not! I still am working at making it a regular part of our day – we’ll get there! Love the post, but as an art teacher I only half agree with you on the color pencils. They should not use most color pencils. Crayola makes a FANTASTIC first color pencil set. They are the same width as early crayons, making them easy to hold. They are also wooden so I don’t get frustrated when they put them in their mouths, like with markers and crayons. This may be a big reason my 18mo LOVES to “white” but my 3yo does not. My 18 mo is also OBSESSED with dry erase markers but I have to watch more closely because she bites of the end of both markers and crayons. I’m going to have to get her a journal though! Thanks so much for the colored pencil recommendation, Krysta! I put a link to those in the post. Definitely something to check out! My 20 month old loves to draw too, and we have to watch him because every marker will dry out if he gets his hand on them… I hadn’t actually thought of getting him a journal yet, but you’re right – that’s something to do. He does love to be at the table and write with his older brothers! Little hands need little pencils/markers to help them use the finger/thumb grip rather than the fist grip (with shorter supplies they are more likely to grip correctly) Use pencils like the ones from putt putt golf and “antique” bowling pencils. Those were the days! Also “Pipsqueaks” make a wide marker and a skinny marker. The dollar stores near here often sell hard cover journals with plain white pages – no lines. I buy as many as I can. My Grandchildren use them during church, it keeps them busy while their parents and those around them worship. Now if only I could find triangular pencils for the pews that won’t roll to the front of the church! Wow – those would be a great find! I will have to keep my eyes open for those. Carpenter’s pencils are flat – they don’t roll so I’m getting some of those. I like to journal myself. And I’ve found a lot of value in it. This seems like a fun, easy way to share that discipline with my kids as they get older. Yes, the habit definitely gets you halfway there! Thanks for hosting, Jill. I’m definitely learning that starting young is the way to go – my three year old asks for writing time all the time, and today for the first time he drew lines on the paper and filled it in with scribbles instead of just drawing. You know how exciting that is 🙂 Thank you so much for the feature, Victoria! Thank you for checking it out, Eileen! I am new to homeschooling. We have a determined 4 year old that always says “I can do it. I don’t need help.” I don’t have any experience with teaching, however we are starting our journey together to determine what Junior needs in prep for preK. I wish I found this article earlier but it give me peace with a starting line. I just created a writing journal for him today. 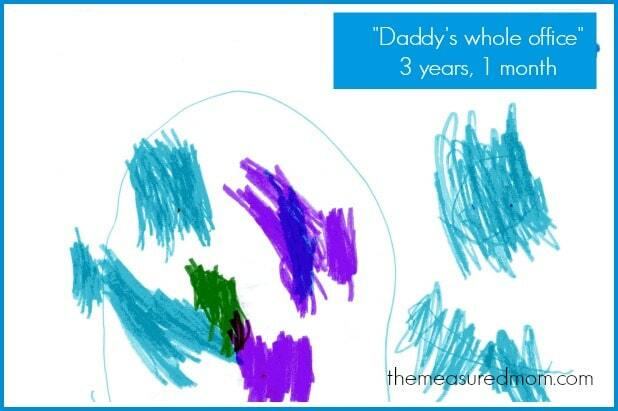 Yes, April, I have a determined 3 1/2 year old, so I know just what you mean! He loves to use his writing notebook and asks for it often. After just scribbling (with some recognizable drawings) for a few months he has started to write letter like forms and the last time asked me to help him spell a word. It gives me comfort because he took longer than his older siblings to learn his alphabet and letter sounds. A relaxed, open attitude toward his writing notebook has been really good for him. I hope you have a lot of success with yours! Thanks for this post! Although I am having a hard time teaching my 3’s and 4’s that just want to scribble that writing has meaning. How do you get them interested/ready to do more than scribbling? Great question, Megan – and guest what? On this coming Wednesday, This Reading Mama and I will kick off a 10-week series on teaching preschoolers and kindergartners to write. So stay tuned – you’re sure to learn the answer to your question! Great idea! My boys are 6 and 8 and i feel like I just need to start over with them! I was a second grade teacher and a third grade teacher. I got great stories from my classroom students, but as a homeschool mom, it’s like pulling teeth! I like this planned writing time, but do you think that they will groan about it? YES, I do think they will groan about it. 🙂 That’s why I think you should try something different to get them interested. Create a box of fun writing tools first of all — like a special new notebook, new writing utensils, erasers, post it notes, whatever would get them excited. Then do something like a chart where you put a sticker for every writing session. After a certain number (start small, maybe with 5) do something simple and special, like make cookies or popcorn or whatever else both of you’d enjoy. I had to do this for my daughter who attends school and wasn’t interested in doing more writing afterward! My preschool boys enjoy writing and don’t need the extra push, but I do something like this for them to get them to read. I have a prize box (think cheap – a balloon or page of stickers). Often these little incentives aren’t necessary for long. Let me know how it goes whether you try something like this or not :)! I noticed that the child in the picture is left handed. My granddaughter is also left handed. Do you have any special techniques for them. Hi, Evelyn! You asked if I have any special techniques for left handed kids. Two of my boys are left handed, so I’ve wondered the same thing! What I’ve been told is to make sure their hand is not floating above the paper while they write (it should slide across the paper like it does when you are right handed). This means they will get smudges on their hand as they right, but that’s how it is with lefties. A big thing to be careful of is that they do not curve their hand up and around as they write. You may need to help them make sure the paper is slanted the right way to keep them from doing this. One writing tip I learned from my mom (she’s a Lefty) is to turn the notebook around so the spiral is on the right. That way the hand isn’t resting on it, which is uncomfortable and can squish the spiral. Thanks for sharing that tip, Kimberly! As it turns out, it appears that FOUR of our kids are lefties (from two right handed parents- crazy!) so we appreciate the tips too. A lot of times, those children feel like they aren’t capable of drawing. It can help to find out why they feel this way (do they mistakenly misunderstand your expectations, or have they compared themselves with someone else). I reassure them over and over again that it doesn’t matter what their page looks like, even if its just a page full of swirls and scribbles. I always have children who say “Ooooo, Teacher, she’s scribbling!” when they see another child scribble. This usually happens at the beginning of the year, and some adult in their lives has previously made it known that scribbling is unacceptable. But, I make it known that its allowed in my room and I only expect each person to do their best. I also show children how to make some things by drawing shapes, starting simple, such as showing them how to draw a sun, a house, a rainbow or some grass. It takes time, but they begin to feel more confidence about drawing. The children who only make scribbles feel the freedom to do so, and freely explore the different art and writing materials. (Also, I think in many cases, children come from homes where they have not had the opportunity for that 1st step to just explore the materials.) Not knowing this reader’s particular child, I don’t know if that will help or not, but this is what I typically find with children in my class. With kids like that I sit down and start drawing, painting – whatever. Then they get interested & curious & come over to see what I’m doing. Keep it very open ended, more like an invitation instead of an expectation & they are more likely to interact. Or extend the opportunity to write & draw into other areas for a purpose. Use something that interests them. Maybe they like animals or have pets. They might like to make signs for the pet supplies, beware of cat etc. 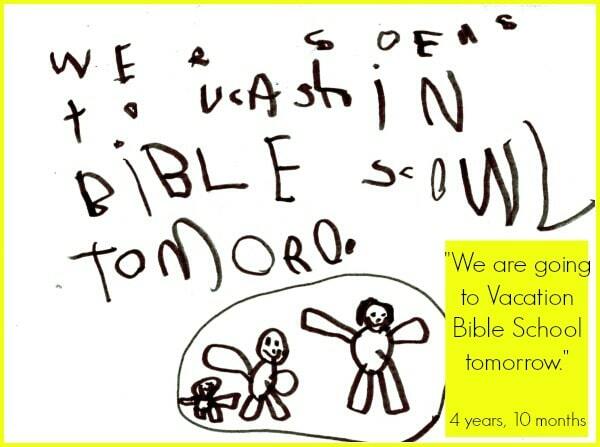 Any suggestions if your preschooler refuses to write without help in spelling correctly? We started a journal this winter based on your blog entry and my 4yr old loves it. I get frustrated, however, because after she does her drawing she refuses to write without my help to ensure that everything is spelled correctly. She is in the early stages of reading so she doesn’t want to just do things phonetically. Any advice? I am a kindergarden teacher in Africa. There are not many books or materials here and I must tell you that your website is a real helper and inspiration. Therefor I would like to thank you and wish you a wonderful New Year. You’re very welcome, Barbara – may you have a blessed new year as well! Thank you for this information and the pictures. My son is almost 7, but has some DD. Luckily he loves reading time and is really starting to pick up his site words.. However, he becomes very frustrated with writing. These tips are so helpful and very appreciated! Thank you! I’m so glad you’re finding things to help your son here, Cara! That’s wonderful news that he loves reading. Even for kids without developmental delays, writing development is often behind reading. The great thing is that when you teach both reading and writing, they support each other and kids grow in both areas. Have fun! I have been looking to see what others do with their journals. I like the way you lay out your information. I am teaching 16 4 year olds this year. I use them as a gathering time activity. As the kids come in to the room they get their journal off of the shelf and sit down to do their journal. I write the date at the top and offer to write about their drawing if they want. Now they are starting to write the date themselves and even make a few letters to describe their picture. I am using regular college ruled composition books because they are .50 each. A teacher that I had seen use them before said get the plain ones or 1/2 page ones if you can, but if not don’t worry about it. I am finding that my kids ignore the lines, even the ones that are writing letters. We are working on a few skills: finding the NEXT page, only drawing on one page or two facing pages, writing the date at the top, drawing or writing creatively or from memory, and holding a pencil correctly. Our school does handwriting work book pages with marker, so I am giving the choice of 3 different size pencils for this activity. I am buying different pencils at dollar tree to make it interesting. They love the holiday or character themed pencils, normally these kids would not choose to use a pencil, so it is nice to see them excited about it. The younger kids usually like the golf pencils or the fat ones. I am finding that the more we do it the more they draw from memory, as in what happened at home or an animal we learned about. All of their other writing in class is teacher directed, so it is nice to see them want to write and do it willingly. It helps them see a purpose in those boring workbook pages. Your journal routine sounds fabulous, Dawn! You’ve obviously put a lot of thought into it and are giving the children a lot of freedom within a structured setting. Way to go! We have just returned from the most amazing 5 day ‘Train the Trainer’ course at the Rhodes University in Grahamstown, South Africa. This is exactly what our facilitators were saying. You are right on track! Congratulations on some brilliant ideas. a teacher I saw the benefits of daily journal writing, and I hope I will see that same success with my grandson. Thank you for sharing your ideas! Try making your writing time at breakfast or snack time. I do this in the pre-K classroom. They are already sitting and settling in. Give them a chance to slow down, write and chat about thier with with me or their table mates.